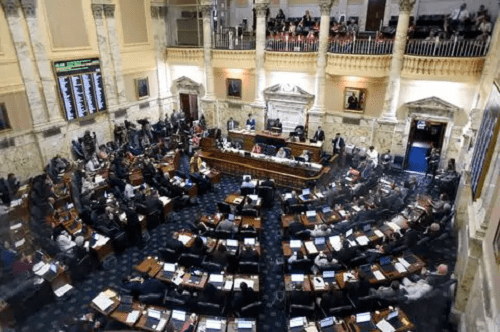 Maryland lawmakers began their 90-day session with questions about Senate President Thomas V. Mike Miller’s health and ended it mourning long-serving House Speaker Michael E. Busch. In between, they passed hundreds of bills, addressing issues from oyster sanctuaries to tanning beds to medical marijuana edibles. The measures must be sent to Gov. Larry Hogan (R), who can veto them, sign them into law or allow them to become law without his signature. $15 minimum wage: Companies with at least 15 employees have until 2025 to raise wages to at least $15 an hour. Smaller companies have until July 2026. The legislation was already vetoed by Hogan, who said the higher wage would hurt businesses. But the General Assembly overrode the veto. Marijuana edibles: Pot brownies, chocolates and other ediblescould be sold for medical purposes, which advocates say would reduce the risk that comes when people try baking cannabis snackson their own. Higher smoking age:People under 21 will not be able to buy tobacco in Maryland anymore if the measure is enacted. Members of the military who are 18, 19 or 20 would still be able to buy tobacco products if they show their military IDS. Tanning bed ban: People under the age of 18 would not be able to use tanning beds, which are known to substantially increase the risk of skin cancer. Oyster protections: Five oyster sanctuaries will be protectedfrom harvesting, a move that environmentalists say is necessary to restore the health of the Chesapeake Bay. Hogan, who vetoed the bill, said it would hurt watermen. The General Assembly overrode his veto. Goodbye foam: Maryland would become the first state in the county to ban plastic foam cups and food containers. Products packaged out of state, such as dried ramen soup sold in a foam cup, could still be sold. Renewable energy: A bill mandating that Maryland get 50 percent of its electricity from renewable sources, like wind and solar power, was approved Monday by the legislature. The state would have until 2030 to meet that target and must study ways to reach 100 percent renewable energy by 2040. Same-day voter registration: Approved in a ballot question last year , the measure allows would-be voters to register on Election Day and immediately cast their ballots. Drug affordability board: The first-in-the-country board would cap the costs of certain prescription drugs when purchased by state and local government employers. If successful, it could be expanded to other employers. The board’s decisions to set caps would have to be approved by the Legislative Policy Committee, a panel of top state lawmakers. Easier health insurance enrollment: The General Assembly approved legislation allowing Marylanders to begin the process of enrolling by checking a box on their state income tax returns. Expanded child-care tax credit: The credit can only be claimed by parents making less than $50,000; the legislationwould expand it to those who make less than $143,000 — another 110,000 people. Lynching commission: The commission would hold public hearings in regions where lynchings have been documented and weigh recommendations, including from families of victims, on how to address the legacy of such crimes. Johns Hopkins police force: Amid a surge in violence in Baltimore, lawmakers approved legislation that would allow Johns Hopkins University to create a private armed police force. Reform of UMMS board: Members of the University of Maryland Medical Systems board, including Baltimore Mayor Catherine E. Pugh (D), are facing accusations of self-dealing following revelations that nine have lucrative business contracts with the system. The legislation would bar members from holding single-source contracts with UMMS and require stringent financial disclosures. The current board would be dissolved in stages. Aid-in-dying: A bill that would have made it legal for doctors to prescribe a lethal dose of medicine to terminally ill patients who want to end their lives advanced for the first time in four years — only to fail with a dramatic tie vote in the state Senate. Repairs for racetracks: Lawmakers from Baltimore City refused to support the bill, after officials raised concerns it would lead the Stronach Group to pull the Preakness out of Pimlico, a Baltimore racetrack that has hosted the second leg of the Triple Crown for decades. Look-back window for abuse victims: The bill would have created a two-year period in which adults sexually abused as children could file civil lawsuits against institutions that protected their attackers. Opponents said it would violate protections for the Catholic Church and other institutions that were included in a 2017 bill that expanded the window for filing lawsuits. Long gun b ackground checks: Lawmakers failed to reach a compromise on a bill to require background checks for private sales of rifles and shotguns. Suing private schools: A bill that would allow private schools to be sued for discrimination was pushed by the American Civil Liberties Union of Maryland, as well as parents who alleged their child’s school discriminated against them because they were gay. Currently, only public schools in Maryland can be sued for alleged discrimination.